Despite decades of progress, the human toll of workplace tragedies continues to be unacceptably high. 376 California workers were killed at work in the last annual count, about one per day. Thousands more were injured or made ill from preventable workplace hazards. When employers fail to protect workers, the public health suffers. 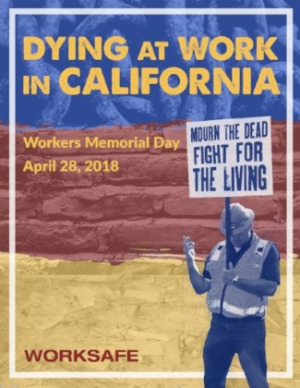 Dying at Work in California 2018 is Worksafe’s seventh annual report on the state of safety and health protections for California workers. The report provides information on fatalities from 2016 and highlights four special issue areas: workplace violence, temporary workers, wildfire response and relief, and immigrant workers. It also includes a partial list of workers who died at work in 2017 as well as a profiles of several of these workers. The report shows that while nationally, worker fatalities are higher than they have been in nearly a decade, California has one of the lowest occupational fatality rates in the country. California’s occupational fatality rate is 2.2 deaths per 100,000 workers, which is below the national average of 3.6 deaths per 100,000 full-time workers. The report cautions, however, that occupational injuries, illnesses, and fatalities are chronically undercounted due to employer failure to document injuries, workers not reporting injuries due to fear of retaliation, and the failure to include injuries and illnesses that develop over time. Alarmingly, workplace violence is the second-leading cause of workplace death in California, accounting for 20 percent of all workplace deaths. 46 of these 77 deaths were homicides and 25 were suicides. Transportation, material moving occupations, and construction and extraction occupations continue to be the most dangerous jobs with more fatalities than other occupations with 109 transportation workers killed and 54 construction workers killed in 2016. Latinx workers continue to be at high risk for workplace death. In 2016, 148 Latinx workers were killed on the job, making up 39 percent of total fatalities. Nationwide, 14 people are killed on the job each day and worker fatalities are higher than they have been in nearly a decade with an alarming number of Latinx and immigrant worker deaths.